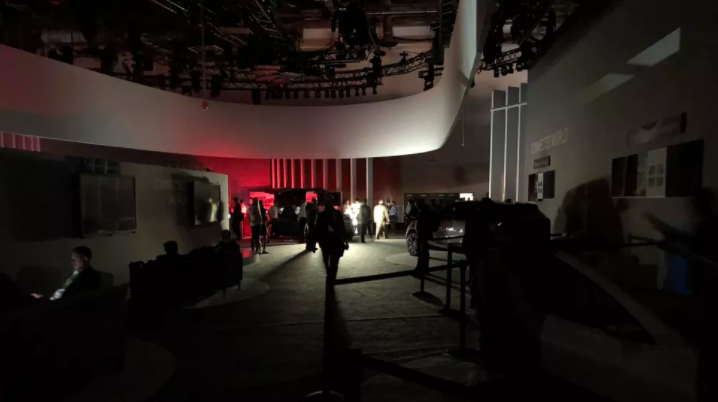 A power outage at the Consumer Electronics Show (CES) in Las Vegas left hundreds of conference-goers in the dark Wednesday. CNET reports that power failed in parts of the Las Vegas Convention Center's South and Central halls on the second day of exhibitions. Power went out around 11:15 a.m. local time, just as the day was ramping up. Attendees reported on social media that power was restored about two hours later around 1 p.m. local time. According to CNET, Central Hall houses the giant booths for the show mainstays, including Sony, Samsung, LG and Intel. Around noon, security guards reportedly refused entry to the entire Convention Center. It was unclear whether there was a source for backup power. CNET's Tim Stevens reported the power also flickered at the Cosmopolitan Hotel across town. CES organizers said it was an "isolated" outage. Earlier, they encouraged attendees to "visit our exhibitors in South Hall and North Hall" until the power returned. Several attendees shared photos of the outage using the hashtag #CESblackout on social media. Intel jokingly referred to the blackout as "the biggest thing" to hit the convention. CNET editor Claire Reilly shared her view of two security guards standing in the dark. But according to CNET's Brian Tong, the power outage didn't disrupt all demonstrations on the showroom floor. CES is the largest consumer electronics show in the world, attracting about 184,000 attendees and more than 4,000 exhibitors. Follow CNET's live coverage of day two of CES here.